The A25 can be connected to a mobile phone, laptop, tablet, etc. for Bluetooth or WI-FI wireless digital audio. Digital or analog audio connections to iPod, iPhone, iPad, CD, DVD, and TV HD box. It is equipped with an optical fiber digital signal input interface and has 24Bit/192K digital-to-analog conversion accuracy. The preamplifier section uses the ECC83 tube common cathode amplifier circuit, and the ECC88 tube acts as SRPP for buffer amplification; this unit has beautiful sound and large dynamic performance. The tube and transistor hybrid precision high voltage regulated power supply has extremely high voltage stability. The AC ripple coefficient is extremely low, and the tone performance is more "stringed". The power amplifier part consists of 8 Toshiba high-power transistors and a 0dB current amplifier circuit. The sound is warm and sweet, and the sound energy and large dynamic performance are excellent. It can easily drive various speakers. The tube circuit cross-connection and back-off capacitors are German WIMA brand MKP series audio special capacitors. 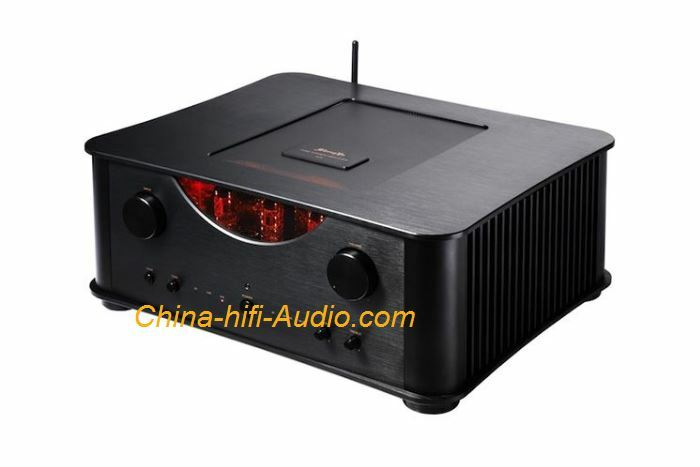 The filter capacitor used in the transistor power amplifier power supply is the Japanese ELNA brand FORAUDIO series 10000uf/80v specification, which has excellent performance in both tone and sound field; it plays an important role in improving the sound quality and tone of the whole machine. The Japanese ALPS remote-controlled volume potentiometer features low noise, no sound, and minimal error between the two channels. A straight-through or tone switch can be selected, and the tone uses a negative feedback circuit to make the sound truly natural. An equal loudness switch function is added to boost the performance of the high and low sounds at a small volume. The output uses large gold-plated binding posts for easy connection to any speaker cable. The aluminum alloy multi-function infrared remote control makes the operation feel better and more fashionable.